Decades ago everyone, from the most fastidious, high-born lady to the farmer in the field to the messiest kindergartener carried a hanky. Of course, the style and quality of their hankies varied greatly. The hanky was a small soft piece of fabric, necessary for wiping faces, noses, fingers, eyeglasses, etc. Disposible tissues have replaced the hanky as a useful textile. Today the hanky is just an obsolete accessory until it becomes a vintage & collectible hanky. A collectible hanky has defined attributes and no real purpose in life, aside from being beautiful, interesting and collectible. Some people put vintage hankies to decorative use, as in shelf liners with a row of pretty points draping along the edge, framed collections, hanky quilts or aprons. Others have made a lovely tradition of enclosing a hanky inside a greeting card. For many, collecting hankies is simply a way of enjoying vintage textiles. Some collect a specific category of hankies, some, anything that catches their eye. First a few specifics: Hankies have been around for a long, long time. The name handkerchief translates from Old English as "a kerchief in the hand"; from French "a small fabric worn on the head". Most vintage hankies are basically square; a few floral prints are round and the lipstick hanky is rectangular, resembling a tiny, pocket-size towel (usually red). Children's hankies range from about 8" to 12", ladies' from about 10" to 18" and men's up to 24". The favored fabric is lawn linen, a very finely woven grade, soft and almost, but not quite, sheer. Cotton is acceptable, particularly in children's or work hankies. Some very beautiful hankies were made in the Orient; silk flosses hand embroidered on silk. 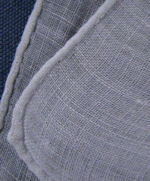 The best hankies usually have a hand-rolled hem, which looks the same front and back. A common problem of the beginning collector is mistaking something something else for a hanky. Because some vendors simply present a basket of little, lovely pieces, you need to use your own discretion. Cocktail and tea napkins are the appropriate size but not always the right shape or fabric. Take a second look if it's not square. Napkins are usually a heavier, stiffer fabric, not almost sheer. Organdy, while wonderfully sheer and dainty, is stiff and would feel unpleasant on your face. If it's larger than your usual hanky and silky, it's probably a scarf. If it's round or oval and lacy, it's probably a doily. I know ... a lot of usually and probably here; but that's life in the vintage hankies world. Vintage, by definition means older. The automobile industry uses the term "pre-owned". Vintage hankies evoke a touch of nostalgia, sentimentality. You may picture the original bride or child who owned your hanky. The wedding hankie is still often a part of the bride's ensemble. There is some latitude here; it's bride's choice. However, it is almost always white, very occasionally with touches of blue, and fancy. Most often the wedding hankie has a fine, lawn linen center inside an elaborate border of lace, embroidery, whitework or combination of all. The design is most often all around, not just in one corner. A handmade whitework hanky, while not necessarily a wedding hanky, is a lovely choice for the bride. Of all vintage hankies, the wedding hankie is the one destined to be kept and cherished over the years. It may be folded and stitched to be used as a Christening cap for the bride's children, then unstitched so that her daughters or daughters-in-law may carry it on their wedding days. Bridesmaid, flower girl, mother-of-the-bride and wedding favor hankies are included in our vintage wedding hankies section. There are occasions when a gift is not quite in order, but somehow Hallmark doesn't quite say it all. Enclosing a vintage monogrammed hanky in the greeting card says that you cared enough to choose the initial, style and color to give a small lasting memento of the occasion. 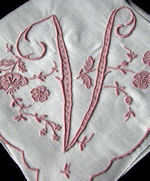 Most monogrammed hankies are handmade, with elaborate single initials in embroidery or applique. Madeira embroidery, with its dainty, intricate embellishments and exquisite workmanship is popular amongst the ladies. You will recognize it by the tiny, seed dots that make a delicate texture within elements of the design. 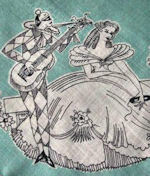 Inexpensive, and colorfast fabric printing brought the era of floral and designer print hankies. Every variety of flower was printed as a border, floral spray or single blossom; and many young ladies chose a special style, flower or color as their "signature", much like a certain perfume. A few floral print hankies were manufactured as round hankies, rather than square, and these make lovely collectibles. Children's hankies, which tend to have a shorter life-span than most, were often printed, and not of the best quality. Clowns, circus animals, pets abounded. 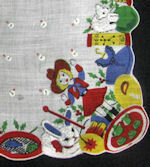 Although it is difficult to find children's hankies in good condition, their adorable designs make them desireable. Some vintage hankies originated as collectibles. Souvenirs of holidays, places, organizations or events were centainly not intended to cleanse the sweaty brow. Grandma's honeymoon hanky from Niagra Falls went straight to the scrapbook. Christmas, Valentine's Day, state map, dogs, advertising, calendars, ANYTHING may form the basis for a fascinating hanky collection. Certain designers became popular for innovative hanky and linen designs. Designer-signed vintage hankies, such as those by Tammis Keefe, Jeanne Miller or Anne Klein, are usually more desireable, and expensive, than unsigned; although not necessarily more interesting. Irish linen hankies are in a category of their own in that they are a home craft, have been made for a long time and still continue being made. The seamstress purchases hanky-size squares of Irish linen, called hanky blanks. These may be purchased in white or pastels. She then edges each square with her own handmade lace, most often crochet, tatting or hairpin lace. The all-time classic hanky is white Irish linen edged with white tatted lace; every lady owned one. 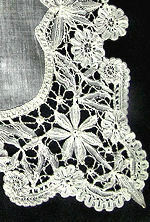 A common variation includes edging and a display corner showing a figural lace design such as a butterfly, little girl or pansies. Men's hankies are very, very seldom collected. In a word: BORING! Vintage working men's hankies usually showed a stripe or plaid, usually in a one-color scheme. A hanky worn to the office usually showed the stripe or plaid in white-on-white woven Irish linen; nice but not much variety. Even men's embroidered monograms were usually small, plain and worked in one dark color. Occasionally, you will find a finely executed hand embroidered silk monogam on a silk hanky; cream-colored. Still not exciting. Today's colorful pocket squares may become tomorrow's collectible but they're not yet vintage or collectible or even, technically, hankies. The appearance of a clean, white hanky logically shows cleanliness or fastidiousness; not quite so logically, morality. But the language of hankies goes much further. Hankies have long been used to convey messages. A hanky sent to King Aghar of Edessa by Jesus Christ is said to have caused the king's recovery from disease. Hankies rubbed on the clothing of the prophet, Muhammed, were said to carry the gift of abundance. Shakespeare used a special silk hanky in his play, Othello, to show deterioration of love and trustworthiness of his characters. In medieval times hankies carried secret messages between lovers. The color or decoration of the hanky meant something; whether it was held or worn, left or right, waved in a particular fashion; a multitude of unspoken nuances were sent and received. For instance, a white hanky signaled "I love you", a hanky with a burned corner "I burn with passion", a hanky around the neck indicated an apology. The grieving widow carried a black hanky; a switch to color announced her renewed availability. A flirtacious lady would drop her hanky near the desireable male to invite an introduction. In our wild west, women were scarce; but human nature still craved the pleasures of music and dancing. 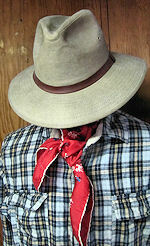 Men wore different colored hankies (the type we now refer to as bandanas) to differentiate gender roles in square dancing. In the 1970's a specific hanky-code appeared in the gay bars of New York City. The color and position of the man's pocket square made clear his sexual preferences. Vintage hankies make an interesting and varied collection at very little cost. As with everything, beauty is in the eye of the beholder; but, of course, there are guidelines. Consider the condition of each hanky. Serious collectors seldom tolerate damage ... any little hole, fray, stain or fading makes the hanky less acceptable. Rarity is the second factor. As mentioned above, a signed hanky is considered a bonus. Within your chosen category you will soon realize that some designs are harder to find than others; for example: state map hankies ... tourist states such as Florida and California are more available than Maine or Deleware; in floral print hankies, usually a single asymetric bouquet is more desireable than a border. Depending on your preferences and shopping venue you should be able to obtain most hankies starting at a few dollars and less than, sometimes far less than, $20. The exception is the antique wedding hankie with handmade lace; antique and handmade being the characteristics that increase the desireability. Some leeway in condition is given to antique wedding hankies. Small flaws are tolerated, more in the fabric than in the lace. Although noticeable stains decrease the value; a general creamy, off-white or shaded effect adds to the charm. If you choose to collect these beauties, study handmade laces to be sure you know what you are looking at and expect to pay considerably more, sometimes several hundred dollars. The hanky styles described above are just a few of those displayed at Hearts-Desires. The link below brings you to specific categories that you will wish to view while familiarizing yourself with vintage and collectible hankies. Hankies illustrating this article are samples of the those that you will find for sale here. Complete Website Contents -- Linens, Lace, Hankies, Home Decor, Etc. Etc. !